During the summer I get obsessed with bright, fun colors. 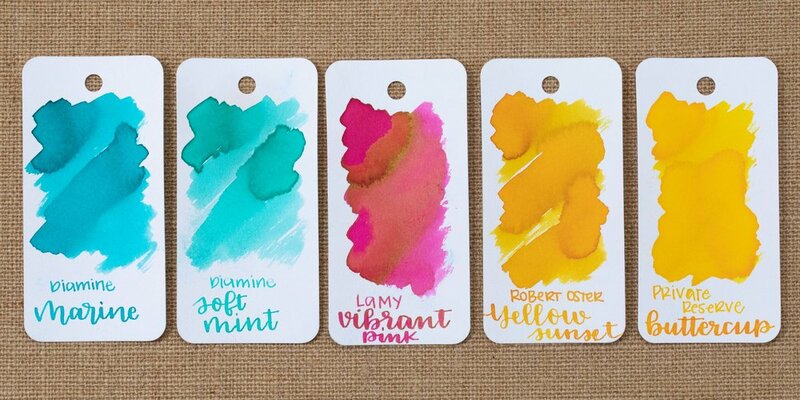 Bright yellow, pink and teal are some of my favorites. Summer at my house also means lots of fresh fruit. Three of my kids' favorite fruits are dragonfruit, raspberries and blueberries. Let's match some inks! Diamine Marine is the first ink bottle I ever bought, and I'm still in love with it 3 years later. Soft Mint is a beautiful color, one of my favorite Diamine inks. I don't think you can go wring with a bright pink in summer. Yellow Sunset is still one of my favorite yellows of all time. It has some amazing shading and is dark enough to be readable. Buttercup is pretty light, but still a great color. I might be developing an unhealthy obsession with ink swabs. I love making them. Summer is here, grab some sunscreen and go outside!